This exercise asks that students read and reflect upon Sharon Boothroyd’s blog post entitled, Beneath the Surface. In the blog post, Boothroyd applies photographic theory to the image, Insomnia, by Jeff Wall, in an effort to deconstruct and decipher the image’s meaning. Having already studied Liz Jobey’s comprehensive essay, A young Brooklyn family going for a Sunday outing, N.Y.C. 1966, and met the challenge presented by Roland Barthes’ Rhetoric of the Image, I found Boothroyd’s analysis of Insomnia refreshingly terse. Boothroyd opens by setting the scene, effectively describing the denoted elements in Wall’s image. While Roland Barthes describes the denoted image as the point “below which the reader would perceive only lines, form and colour” (Barthes), Boothroyd, showing a little more warmth, suggests that denotation “tends to strip things of their poetry” (Boothroyd 2012). While the narrative is obviously set in a kitchen, Boothroyd describes how Wall uses the stark scene, harsh lighting and a cold palette to build an eerie feel and sense of unease (Boothroyd 2012). The cupboard doors left ajar connote “searching for an unfound snack to satisfy some unmet desire” (Boothroyd 2012), while the man’s posture and position on the floor reveal frustration, anxiety and a state of tension. The photograph title, Insomnia, opens a discussion on the possible causes of this man’s plight. Interestingly, Boothroyd draws a comparison with Shakespeare’s use of insomnia (usually with madness) “to portray guilt and a sense of regret” (Boothyroyd 2012). Has this man been wronged or committed some offence, or is his insomnia the manifestation of some financial or work pressure (Boothroyd 2012). To gain a greater understanding, Boothroyd suggests that Wall’s image must be positioned “in the context of the wider canon of art, literature and film” (Boothroyd 2012). Wall’s desire is to create a “dialogue between his works and those of other historical and contemporary artists” (Boothroyd 2012). A Sudden Gust of Wind (after Hokusai), is inspired by A High Wind in Yeijiri, Suruga Province, one of the woodcuts in Hokusai’s series, Thirty-Six Views of Mount Fuji. 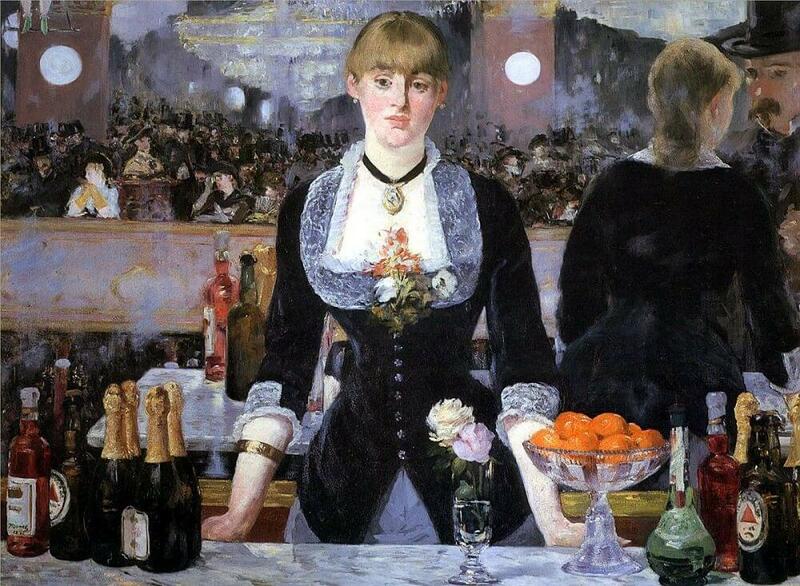 Picture for Women is described by Wall as “a ‘remake’ of Manet’s picture, The Bar” (Wall 1985). As many of Wall’s photographs reference other artists, Boothroyd suggests that “we must recognise this deliberate intertextuality” (Boothroyd 2012). In other words, Wall deliberately creates work that allows for reading in relation to the original work to which it refers, thus conferring richer meaning on both, and indeed subsequent works. Jeff Wall, a major retrospective exhibition held at the Museum of Modern Art in both New York and San Francisco, displayed excerpts from essays and interviews by Wall, accompanying the works on view. The quote below appears in the exhibition alongside Picture for Women, and sheds some light on Wall’s interest in intentional ‘intertextuality‘. Boothroyd’s blog post is by no means a definitive deconstruction and analysis of Jeff Wall’s Insomnia. In fact, Boothroyd goes as far as inviting students to pick up where she left off and contribute to the scrutiny of Wall’s image. In adding to the analysis, my first thought is that Wall seems to have taken the photograph in a manner so as to eliminate all true horizontal and vertical lines. In studying the image, I was unable to find a single line which ran parallel or perpendicular to the frame, and in doing so Wall has essentially made every line a diagonal, thus throwing the room into a state of instability. The empty bag on the fridge, the separation of the salt and pepper, the knife laying on the butter plate, the towel thrown over the chair, the open cupboards and the open packet of food next to the coffee maker, all add to the general untidy appearance of the room, increasing the feeling of tension and unease. The chairs are positioned with maximum loss of floor space, creating clutter, and in turn heightened anxiety. The man on the floor lies in an uncomfortable position, his body representing a state of anguish, as if moving him into a foetal postion would pacify the image. If the ‘stadium’ of the image is a state of flux, where everything is in disarray and unhinged, then the ‘punctum’ of the image is the neatly stacked pile of washed dishes on the draining board. They effectively say that everything in the image is temporary and fleeting, order will return again soon. Wall has steered the viewer toward his intended meaning in utilising ‘anchorage’ in the delivery of the ‘linguistic message’ through the photograph title. The image title, Insomnia, immediately open a dialogue and engages the viewer. This deconstruction and analysis has been extremely enlightening. I find Jeff Wall’s work fascinating and his attention to detail absolutely incredible. Barthes, R. (1977) Image, Music, Text, translated by Heath, S., London: Fontana Press. Boothroyd, S. (2012) ‘Beneath the Surface’, WeAreOCA Blog [online], 17 Oct, availabe: http://weareoca.com/photography/beneath-the-surface/ [accessed 25 Apr 2016]. Galassi, P. (2007) Jeff Wall, New York: The Museum of Modern Art. MoMA (2016) Jeff Wall – In His Own Words [online], available: http://www.moma.org/interactives/exhibitions/2007/jeffwall/ [accessed 25 Apr 2016].